MDC-T national chairperson Lovemore Moyo says a “Lacoste cabal” working with the opposition’s enemies has captured the party and staged a coup to ascend to the top. Moyo likened the vicious succession squabbles following party leader Morgan Tsvangirai’s death to the actions of Zanu PF’s Lacoste faction that outsmarted the rival G40 and staged a coup in the ruling party and government in November last year. “As we speak, the MDC-T Lacoste cabal is running away with the party, violating every known rule, principles and values, including the party constitution,” Moyo told the Zimbabwe Independent in an interview. The late Tsvangirai’s deputies, Elias Mudzuri, Nelson Chamisa and Thokozani Khupe, are locked in a tussle to take over the reins of the party. 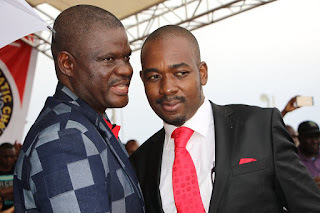 Mudzuri and Chamisa both claimed to have been appointed by Tsvangirai acting president while he was battling aggressive colon cancer in a South African hospital. Khupe has argued she is the rightful heir by virtue of having risen to the post at the MDC-T’s last elective congress. According to Moyo, the MDC-T has been captured by the “Lacoste cabal”, but the former Speaker of Parliament would not be drawn into revealing the names of the alleged clique. “The office of the national chairman calls upon all party cadres to concentrate on the task at hand, that is, to win the next harmonised elections. Accordingly, all party members and structures are directed to resist and seriously guard against the leadership and party capture by a political clique, in collaboration with our enemies, which is now a reality in the party,” Moyo, who last month told the Independent he would not contest in parliamentary elections later this year, said. He also said he will not seek re-election as the party’s national chairperson at the next congress.